After last week’s piano/percussion extravaganza, Monday’s Intermezzo Chamber Music Series concert was a bit more subdued. After all, there was Mozart on the program Monday. But the three works preceding that offered some spiciness, and the end result was anything but tame. The concert put members of the Utah Symphony’s woodwind section in the spotlight — and principal oboe Robert Stephenson in the hot seat. He was a last minute replacement for Lissa Stolz, who had to bow out because of illness. 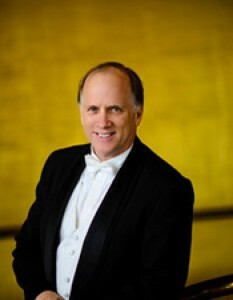 (According to Intermezzo president David Porter, Stephenson didn’t get the call until about an hour before the start of the concert.) But one would never have guessed he wasn’t originally scheduled to play; he acquitted himself splendidly in the two works he played. The others were also fabulous, and it was a remarkable and memorable concert. Stephenson and symphony colleagues Mercedes Smith, flute; Erin Svoboda, clarinet; Lori Wike, bassoon; and Ron Beitel, horn, got things started with a delightful account of Jacques Ibert’s bouncy 3 Pièces brèves. They captured the playfulness and lyricism of the three short movements with their well crafted and executed interpretation. Before intermission Smith and pianist Caleb Harris gave a sizzling account of Sergei Prokofiev’s Sonata in D major for Flute and Piano. The work tests the mettle of the flutist and Smith sailed through it with flying colors. She gave a stunningly virtuosic performance that was nuanced and also underscored the lyrical content of the score. It was a superbly crafted reading that put Smith’s technical prowess and musicality on display. The second half began with György Kurtág’s pungent Bagatelles, played by Smith, Harris and symphony bassist Jens TenBroek. The score is wonderfully vivid and, even though the six movements are extremely brief, it shows the many influences that are at work in Kurtág’s musical language. The work as a whole is kaleidoscopic in character, paying homage to a number of composers, including J.S. Bach, and ends with a wickedly hallucinogenic reworking of Claude Debussy’s piano piece, La fille aux cheveux de lins. The three gave an imaginative and wonderfully crafted account that had depth, and they also incorporated a broad palette of expressions into their playing. The concert ended with Mozart’s Quintet in E flat for Piano and Winds, K. 452. The five (Stephenson, Svoboda, Wike, Beitel and Harris) displayed great ensemble play as they imbued their account with nuance and gorgeously expressed lyricism. Their playing was fluid and their interpretation was spot on. It was an exquisite performance that was well balanced and cleanly executed.